This article by Mike Blaudschun of the Globe talks about the future of the Big East. "A basketball-football split seems a question of when, not if. UConn coach Jim Calhoun foresees the split coming sooner rather than later, which would leave the Big East with an eight-team basketball league of Marquette, DePaul, Seton Hall, Villanova, Georgetown, St. John’s, Providence and perhaps Notre Dame and a football branch of UConn, Louisville, Cincinnati, South Florida, Pittsburgh, West Virginia, Syracuse, Rutgers, TCU, and, for the sake of argument, Central Florida." He goes on to speculate that the Big East would add two teams. I don't think Army or Navy would join. Army tried that with CUSA. The service academies need to be able to tailor their schedules to have some teams they can beat. The other is Notre Dame. Changing circumstances in college football and the collapse of Catholic identity have reduced the Irish to just another (good) football team. The days of Notre Dame being the 600 pound gorilla of college football are over. The Richmond Spiders have become more open to FBS transfers. Speaking of splits, a CBS Sports writer thinks college football could split into BCS and non-BCS levels. I've got the scans from 1988 almost ready to go. I hope to have those ready by tomorrow. There should be some more recruiting news later in the week. Well, Memorial day weekend is usually a slow couple of days for football news and so it is this year. I hope to have another year of game programs scans up later this week. The football magazines should start showing up is a week or so. I'm sure there will be a lot of football stuff to talk about. In the meantime, Mrs Blog and I wish everyone a safe and pleasant holiday weekend. 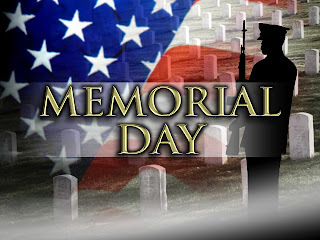 The Wall Street Journal has an essay by James Hornefischer about Memorial Day and World War II vets that is an excellent read. So is his book "The last stand of the Tim Can Sailors" if you should be looking for something to read on a summer vacation. Rivals.com reports UMass has offered to Erick Haywood, a 6-2 212 pd Athlete from Orange Park, FL. His Rivals.com page is here. Haywood played both ways for Orange Park, HS. Ran a 4.48 40. Averaged 8.2 yards a carry running the ball. Besides UMass, Haywood holds offers from Illinois and Southern Mississippi. Showing interest are Arkansas State, Duke, Georgia Tech, Nebraska, Southern Florida, Syracuse and USF. Jeff Thomas has an article on UMass making the cut on the NCAA's APR. In the past, UMass and Delaware have accepted a lot of transfers, which has a negative effect on APR, so those two schools have usually finished near the bottom of the CAA in APR. Now that we are FBS, any transfers would have to sit out a year, so we will likely be taking less of them, with a corresponding positive move in APR. The UMass website has a story about an image of James Ihedigbo being entered in the NFL's Hall of Fame Photo contest. They also have a link to an Arizona Cardinals alumni event attended by Marcel Shipp. Shipp is still on the roster of the Las Vegas Locomotives. Craig Haley of TSN has the Top Ten FCS special teams players. Boise State will play at Toledo this year and the game has been moved to Friday Sept 16th in front of a national TV audience on ESPN or ESPN2. Boise State's 2010 #7 ranking will make them the highest rated home opponent ever for Toledo. 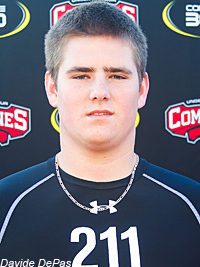 Scout.com reports that UMass has offered to Will Holden, a 6-6 271 pd OL from Green Cove Springs, FL. Junior highlight film here (Holden is #74). Besides the Minutemen, Holden has offers from Louisville, South Florida, Florida International, Florida Atlantic, South Alabama and Southern Mississippi. Craig Haley of TSN interview UMass coach Kevin Morris about the move to FBS. Coach Morris will speak at Professor Thom's in New York tonight as part of the "Together We are One" tour. Three UMass Lax players including Travis Tripucka will play in the North-South Lacrosse All-Star game. The article says Tripucka will play for the Minutemen this fall. The Jets blog "Gang Green Nation" has a post about the Jets offensive line and Vladimir Ducasse. The BC Blog " BC Interruption" continues to supply a lot of bulletin board material for the Minutemen as they have a post on "Who is the fastest Boston College Eagle?". One of the answers is Tahj Kimble (BC bio): "Maybe a few late runs during a UMass or Wake Forest blowout will give us evidence of that." Saw this over on the Draft Daddy Blog. Alabama RB 5-11 225 pd Trent Richardson benches 465, squats 600 and power cleans 365. The CAA's Season Preview is out. Last year at the preseason Media Day, the assembled CAA brain trust picked UMass 8th in their preseason poll. The Minutemen returned only eight starters in 2010, second lowest in the league. Lets see how things look this year. Blogger does not do columns, which would make the following easier to read. The CAA sorted by number of returning starters for 2011. Maine--Returning 8 on both offense and defense. Total 16. Record in 2010 4-7. Rhode Island--Returning 10 on offense and 6 on defense. Total 16. Record in 2010 5-6. Willian & Mary--Returning 7 on offense and defense. Total 14. Record in 2010 8-4. Richmond--Returning 8 on offense and 5 on defense. Total 13. Record in 2010 6-5. Delaware--Returning 7 on offense and 3 on defense. Total 10. Record in 2010 12-2. Villanova--Returning 5 on both offense and defense. Total 10. Record in 2010 9-5. No CAA team will have as few starters returning as did UMass in 2010. However, two of the stronger CAA programs, Delaware and Villanova have significant rebuilding tasks in 2011. William & Mary with 14 returning starters probably will be the top vote getter in this year's Media Day. UMass, Richmond and JMU look like the teams who could make a jump up in league standings. Off topic: Philly.com says Bruiser Flint would be a good fit for Penn State basketball. BC blog "BC Interruption" says the Eagles could be 6-0 by Judgement Day. Three FCS teams will be banned from post season play in 2011 because of low APR scores and ten more will lose scholarships. I'll be back tomorrow with some recruiting news as UMass has offered to a big OL from Florida. The blog wishes Jason Yellin all the best as he was named Assistant Athletic director for Media Relations at University of Tennessee. UMass story here. Matty V. has a story on how Yellin pushed UMass into the digital age. He also was willing to include this blogger in media events and athletic dept releases. Many people would not have been that flexible. The UMass website is tops in the CAA and maybe FCS football nationally. GoVols.com has a press release here. Jeff Thomas of MassLive.com reports that the CAA has the 2011 edition of their football preview here. TSN's "In the FCS huddle" has the Top Ten FCS receivers for 2011. CBS Sports has more on Big East sports and its media package with ESPN. BC Blogger "BC Interruption" looks at the Eagles 2011 schedule and predicts an easy win over the Minutemen. Actually, a successful UMass move to FBS would be a good thing for both BC and UConn. Another BC Blogger "Eagle in Atlanta" says Boston College season ticket sales for 2011 have been "terrible". There is nothing like beating the team of the guy you know at the office or talk to at the gym. UMass-UConn-BC football games every year would be a winner for all three athletic programs. In the NY Giants Blog "Big Blue View", Blogger "The blood of Eli" says the WR-heavy Giants should keep Victor Cruz. ESPN New York reports that Vladimir Ducasse will be working out with a group of dolphins in a "lockout camp". The committee studying Appalachian State's potential move to FBS is delaying the release of their report. More from CBS Sports on possible Big East expansion scenarios. MassLive.com has a story about former UMass star Ben Albert being hired as LB coach at Temple. Minuteman coach Jimmy Reid gave Albert his start in coaching at UMass. Albert coached in Amherst in 1996 and again in 2002-03. I've done a number of posts mentioning Albert in the past. You may have read this article from Matty V. about UMass hockey playing at Fenway Park. One aspect about UMass' move to FBS that needs to be remembered is that there are dangers associated with the move. I've published links to several commentators who emphasized those dangers. On the other hand, there are definite dangers with doing nothing. The world of college spots continues to evolve and standing pat can mean being left behind. Consider the coming of Big Ten Hockey. Take a look at the following image. When I first saw it, I thought it was a Photoshop. Be sure to click on the image to get a feeling for the effect when 115,000 people show up for a hockey game. The Maize & Blue Blog has more on the event and Big Ten hockey (scroll down). Copyright Maize & Blue Blog. Used with permission. The outdoor hockey game at Michigan drew the largest crowd in stadium history------more than football. The Big Ten Hockey League is going to change the landscape of college sports. If schools like UMass want to be continue to be relevant in college athletics, they need the resources to do so. FBS football drives finances in college sports. Hopefully, it will help UMass in women's sports and in men's sports like hockey. How about a future biggest game in New England hockey history in Gillette! Rivals.com reports UMass has offered to Zack Camp, a 5-11 170 pd athlete/DB from Yulee, FL. Camp's Rivals page is here. More information including his 2010 stats here. Was a member of the 2010 All-Nassau County Team. Besides UMass, Camp holds offers from Troy and Western Kentucky. Interested are Georgia Tech and FCS schools Florida A&M, Georgia Southern and Jacksonville. Liam Coen gets involved in recruiting for the Rams. 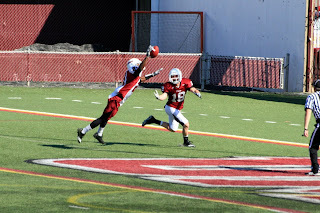 TSN's Craig Haley has the Top Ten defensive backs in FCS for 2011. To play the 3-4, it's generally conceded you need a big, strong guy at NT. Former Penn State DT 6-3 320 pd Brandon Ware is available, but he'd have to sit out a year now that we're FBS. Another MAC conference blog. It looks pretty good. Speaking of the MAC, former Northern Illinois coach Jerry Kill is now the HC at Minnesota. The Golden Gophers lost to Kill's MAC team and a FCS team last year. The Richmond Spiders have an anomaly in college sports: they have a woman Director of Football Operations. A Villanova blog talks about the power of TV markets on the Big East and college sports. This is another reason I think UMass will ultimately get a chance at the Big East. Remember, the UMass-Michigan game tied for the top TV rating for the Big Ten network. This site ranks the greater Boston area as the 7th largest TV market in the USA. If UMass can deliver a significant slice of that market, we will be a desirable school in future league readjustments. More on the Big East expansion. Former UMass star Jeremy Horne (Chiefs bio) is mentioned in this story about the Kansas City Chiefs. Details and dates are available here from the UMass website about this year's Kevin Morris football clinics. I'll be back tomorrow with some recruiting news. The NCAA has announced FCS schools in the Top Ten percent APR. All eight Ivies made the list. Boston College blogger "Eagle in Atlanta" thinks if the NFL season is canceled, BC should move their game with UMass to Sunday afternoon and try to get NESN coverage. University of Massachusetts----ranked #56 in the world. Maybe if this FBS thing takes off, the citizens of the Bay State will identify more with the school and provide the resources to move UMass up. CSI-----Keene State College. It wasn't me. Honest! I don't think I linked to this article about Victor Cruz working out with a bunch of locked-out Giants. 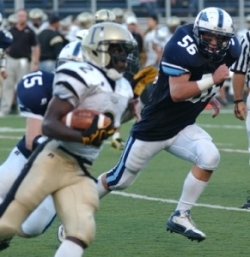 I've blogged three times before about Abner Logan a 6-2 225 pd LB from Newton, MA. Roger Brown has a stub article about Logan's plan to attend several one-day camps in order to increase his exposure to FBS schools. Logan holds offers from UMass, Florida International and Towson. Jeff Thomas of MassLive has a story about UMass' "Together We are One" tour and has a link to a story about MAC team Kent State, who is pulling in a $1.2 million guarantee for a visit to Alabama this year. Northeast powerhouse Monsignor Farrell HS has a new coach---- Jim Bradley. He coached at UMass as an assistant under Mark Whipple. Bradley coached OLB's and LB's for the Minutemen 1998-2000. A Bleacher Report writer would like to see the return of the UMass-UConn rivalry. A UMass grad writes a story about Tyler Holmes being named the top LB in FCS football. 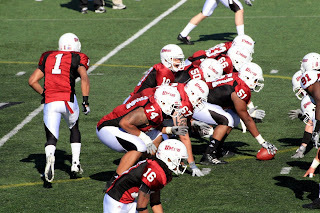 TSN's Craig Haley has a story about the Top Ten offensive linemen in FCS for 2011. The UMass website has a page consolidating all the info around the Minutemen's move to the MAC. The Nashua Telegraph says the recent changes in the CAA have put UNH athletics in a tought spot. "Scarano says it costs, on average, between $35-40,000 to take his team and staff, about 90 people, to a road game in a Mid-Atlantic state, where much of the current CAA schools are based. But costs continue to rise with the price of air fares." “The fact is, it drives a lot of things culturally,’’ Scarano said. “A successful football program sets the tone for the entire athletic program." A couple of days ago I mentioned that the College Football magazines will be out shortly. This site ranks the magazines on the accuracy of their pre-season predictions. A Bleacher Report writer has UMass as one of the teams that could upset an FBS opponent this year. Most insiders consider the Fiesta Bowl's $1 Million dollar fine a slap on the wrist. Next month the College football magazines will be coming out. Phil Steele will be doing a FCS -only magazine for the first time. Lindy's will be out May 31st. I've blogged about Anthony Arcari before. The 5-11 185 pd Athlete signed with DII Merrimack. Note that the article says Merrimack is thinking about going Division I in a few years. I hadn't heard that. Well, Blogger has been down since yesterday afternoon. I've been locked out since then. I guess they're still in the recovery mode. Google has been pushing their "cloud-only" model. This could make a dent in that. The "Together We're One" tour starts on Tuesday May 17th, in Boston. The Rhode Island website has an interview with former UMass star, and current Ram QB coach Liam Coen (Rhode Island bio). TSN has an article on the Top DL in FCS for 2011. William & Mary may not have the services of All-CAA WR Ryan Moody after he injured his knee in spring practice. Josh Buchanan has the 2011 "Small School" superlatives from the NFL Draft. I've blogged before about Derek Beck, a 6-3 190 pd WR from Martinsville, NJ. Beck signed a 2011 letter of intent to play for the Minutemen. He ran a 11.2 100 meters and a 22.5 200 meters in the 21st Skyland Conference Champinship. Beck won both events. Diane Lederman of MassLive.com has more details on how Timothy T. Anderson was selected from a pool of four finalists for the directorship of the UMMB. Josh Buchahan's top 50 undrafted FCS player list has several UMass players. ESPN New York has an article about Victor Cruz (Giants bio) maximizing his time with Eli Manning. It just keeps getting uglier in the Villanova-Big East story. This week the Big East sent a "we-really-like-you-but-not-in-that-way-and-we-hope-we-can-still-be-friends letter". The Syracuse Blog has a very funny post on the Big East Villanova contretemps. Humor aside, you have to wonder :"What were the Big East brass thinking?" They knew the Wildcats didn't have a stadium. They knew Villanova was a small school. They knew a direct move from FCS to a BCS conference was unprecedented. Why let it get as far as it did? This does not reflect well on the league. CBS Sports has a data base for over a 1,000 potential 2012 NFL draft players. They cover Julian Talley, Jonathan Hernandez, Josh Samuda and Emil Igwenagu. The UMass section is here. TSN's "In the FCS Huddle" column has an entry about the top 2012 FCS running backs. Jonathan Hernandez is in the "on the cusp" section. The UMass website has a pair of articles from Business West about UMass' move to FBS and Gilette Stadium. MassLive.com's Alyssa Creamer has a story reacting to the Business West series and also repeats the UMass staff changes story including Tyler Moody. MassLive also has a video tour of McGuirk stadium. It shows some of the things that would have to be changed for it to be an FBS stadium. 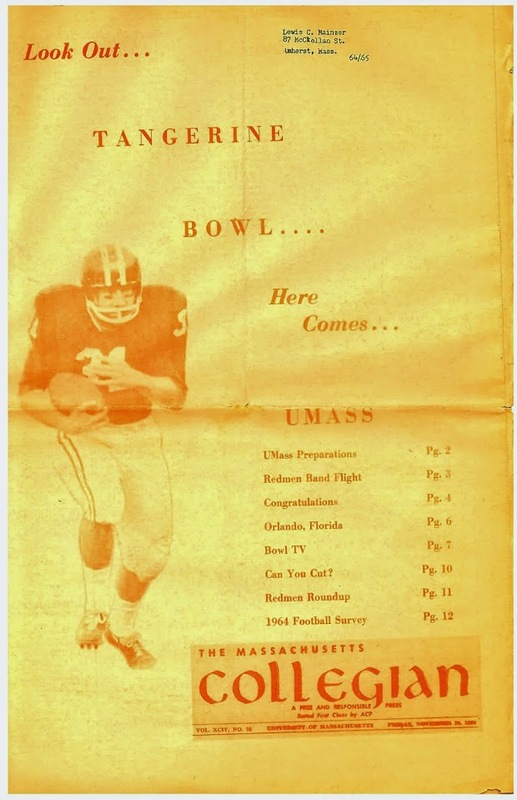 Unlike a number of people, I believe that UMass will return to an on-campus stadium in the future----if we win in FBS. The probable mix will be four games at McGuirk or its replacement, and two at Gillette. But, like I've said, the move to FBS is a process. First we move and get the best deal we can during the transition, next we win, then we talk about what conference is best, after that, see if success and FBS football can be parlayed into a better campus facility. In 2016 we'll have a much clearer vision of what will happen. Meanwhile, enjoy the ride! The Fresno Bee has a story about Fresno State's band director accepting the UMass Band Director job. If you are waiting for our "revenge game" with New Hampshire at Gilette on October 22nd-----forgetaboutit! The world is ending the day before. Geeze, Mrs Blog and I were going to get concourse seats this time! UMass has named Joe Tricario as special teams coordinator. Tricario has experience as DC at both Stony Brook and Fordham. Also coached in the CFL with the Toronto Argonauts. Also new is Tyler Moody, who comes over from Amherst College as Assistant Linebackers Coach. Matty V. has more here. HC Kevin Morris will speak at the New York UMass Association on May 26th regarding UMass football. UMass has picked Timothy Todd Anderson as the new UMass Marching Band director. Anderson comes from Cal State Fresno. More stories from the UMass Daily Collegian and WWLP22. Philly.com says Villanova's possible move to the Big East may be delayed a year. The Wilton Villager reports that Ryan Phillips, a 6-1 220 pd LB from Wilton, CT HS will join the Minutemen as a preferred walk-on. Phillips was All-FCIAC and ALL-State. He chose UMass over UNH and William & Mary. Former UMass HC Jimmy Reid says the Patriots got a winner by drafting Ras-I Dowling. When Jimmy Reid talks up a player, people should listen. UNH had their Spring Game on Saturday. I believe that was the latest in the CAA. Two FCS players were chosen in the first round of the CFL draft. If the NFL actually goes through with the lock-out, college football will be the only game in town. Ok, well that was the longest the Blog has been silent for several years. Sorry, I just could not get the motel's WIFI to work. The Blog has been such a regular event in my life these last years, it was a little weird to be without it. While I was trapped in the black hole, Tyler Holmes was named the top linebacker in FCS for 2011. I thought Holmes looked even bigger and stronger at the Spring game. Moving him back inside should allow him to ring up some huge numbers in his senior season. 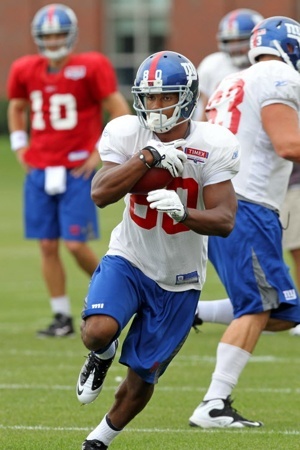 Victor Cruz (Giants Bio) took part in an improvised passing camp run by Eli Manning. MassLive has an image gallery of the new UMass Football offices. It pretty much matches what I took in the Spring Game images. Former UConn players have not had a lot of success in the NFL. It will be interesting to see how the New England recruiting wars play out. UMass was the #1 FCS team in number of players in the NFL last year. The Minutemen were also #1 in the CFL. UMass could make a dent in both BC's and UConn's influence in the Northeast. Mrs. Blog and I will be on the road until Sunday. As usual, I will try to keep the Blog going if I have a WIFI connection. Should the Blog fall silent, I'll be back Sunday evening. The Taunton Gazette has a story about Greg Niland's potential NFL career being on hold. The UMass website has a story about former UMass players James Ihidigbo and Victor Cruz being on the Rachel Ray show. Matty V. has some MAC websites for you to explore. The CAA Blogger has updates on the Spring Games of UMass, Rhode Island and Towson. Inspirational Boston College player Mark Herzlich not only was not chosen for the NFL draft, he fell all the way to #51 pick in the UFL. Speaking of the UFL, this story has details of the UFL pay schedule. Our favorite newspaper, the Boston Globe, was purchased by the NY Times corporation for $1.1 billion in 1993. Now they're trying to sell it for $200 million, a thumping $900 million loss. Matty V. has details of the UMass contract with Gillette. Ticket prices look to be pretty reasonable. Mr. Blog and I have been paying about $40/seat on our trips to Michigan, Kansas State etc------and those were the nose bleed seats. This story about Michigan safety Jonas Mouton has an image of him tackling Anthony Nelson. This article says Villanova may not have any where near the necessary votes to join the Big East. The story also discusses possible future Big East configurations if some of the basketball schools are ejected. As mentioned from other sources, Rutgers is interested in the Big Ten. The Scarlet Knights are interested in the Big Ten because the Big East does not have big revenues. The often mentioned financial bath UConn took at their BCS bowl was because Oklahoma was reimbursed by the Big Twelve for their unsold tickets. The Big East did not do the same for UConn. The USL Destroyers have picked former Georgia Southern foe Adrian Peterson in the third round of the USL draft. Peterson still holds UMass opponent records with his 333 yards rushing and 5 TD's in the 1999 playoff game at Georgia Southern. Marcel Shipp is still on the roster of the Las Vegas Locomotives. Hi everyone. I've uploaded 49 images from the Spring game to a Picasa Web Album. TSN looks at the FCS players in the NFL Draft. Two surprises from the FCS prospective was the Richmond's Martin Paker was not chosen. Neither was Delaware's Pat Devlin. The UMass website has link to a interview with former UMass star Jeromy Miles on the NFL lockout. UMass' writeup on the Spring Game. MassLive.com has a story on Bowling Green transfer Kellen Pagel and asks if he will be eligible in 2011. Ron Chimelis says the team will have to find its own motivation for the 2011 season. I'll add the usually cravat on Spring games. Everyone was playing at about 4/5 speed and some players are usually wearing the wrong number. Forgive me if I mis-identified someone. After all the nervous tension from the upgrade, everyone seemed fairly relaxed and happy to out on the field. The same mood applied to the crowd, which was about the same as last year. I toured the new UMass football offices. They're nice---and empty. No one's moved in yet. Vladamar Brower (who's coaching HS in Springfield) and 2011 QB recruit Mike Wegzyn attended. Amazingly, I did not see anyone on crutches. Both Kellen Pagel and Brandon Hill looked good at QB. Hill was moving well for a player that had missed half of the spring training session. Both QB's showed good velocity. Ryan Carter had an INT. Pitt transfer Chris Burns only had 2 carries. 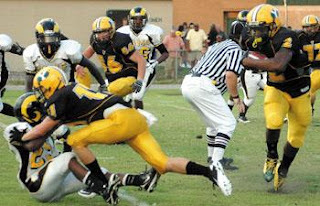 He did have on nice block on a rushing defender. On offense, Anthony Dima was at LT. Jesse Julmiste was the "Y" receiver with the first team offense and Tom Gilson was in the slot. Added to the Spring Game, but not on website roster was James Gilchrist DT. Hope to have a web albumn up tomorrow.